Splendor burst into the boardgaming scene a couple of years ago, becoming one of the most popular board game titles ever. To wit: right now it’s one of the 25 most rated games on boardgamegeek.com and has over 150,000 plays logged on the site. For comparison, Catan has a bit over 200,000 plays logged. No game since Splendor came out in 2014 has more ratings. 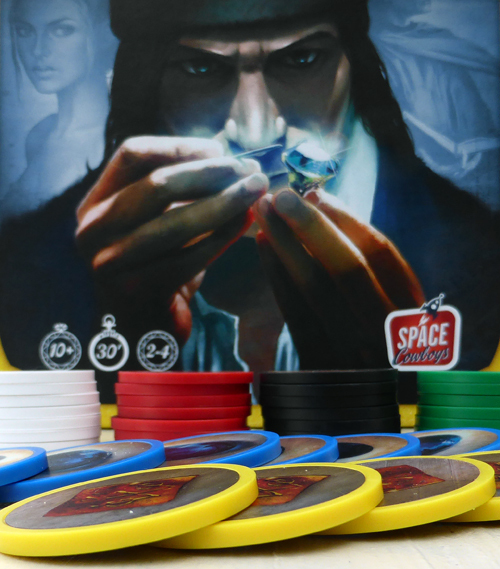 It was nominated for the industry’s most prestigious award, the Spiel des Jahres, and is inevitably mentioned among the best “gateway” or “light” games available. Honestly, I don’t see what the fuss is about. 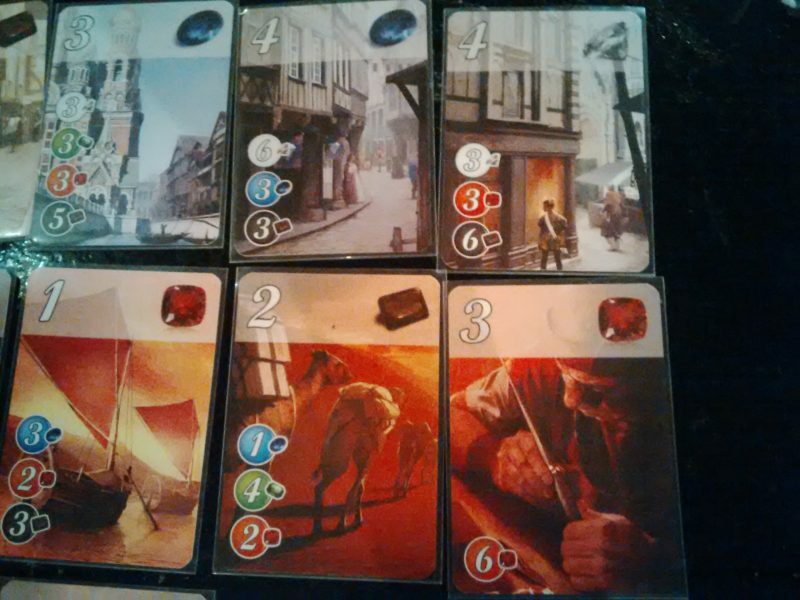 Splendor is not a bad game by any means, but I do not understand why it gained such immense acclaim. In essence it’s an extremely abstracted and distilled example of the tableau-building genre of games. Ostensibly the theme is about gaining rare gems, which allow you to buy gem-creating resources (dig sites, I suppose? ), which then let you buy better, point scoring dig sites. If you get the right combination of dig sites, a noble might visit you to give you points. It’s very thin. I’ll ignore all of that, much like you will about 10 seconds into the game. The game is entirely numbers and colors. A display of 12 cards are laid face up in the middle of the table. On your turn you may collect resources (in the form of delightfully heavy poker chips with images of gems on them), purchase a card using these gems, or take a “wild” gem poker chip and reserve one of the cards to your hand. The cards act like permanent gem resources. In other words, if you purchase an emerald card you will always have one emerald available to spend on your turn. This is just about the most simplified version of the classic eurogame engine-building concept possible. Please don’t take that as a criticism. Simple, easy to learn games can be fantastic. I love Lost Cities, Ticket to Ride, and Sushi Go!. Also, elegance as a design concept can produce beautiful results. Even though I am hopelessly lost when playing Go, I can see that it is a masterful feat of design. 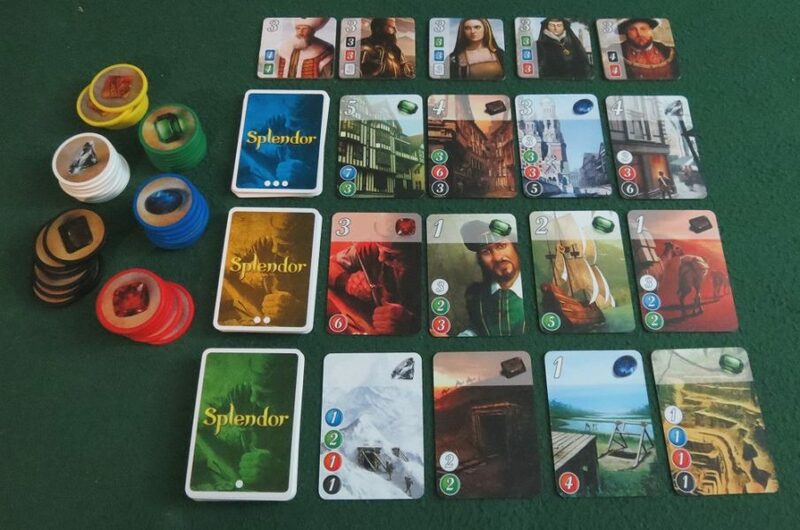 Splendor is extremely easy to learn and elegantly designed. The problem is that by stripping the tableau building concept down, the designer has also stripped away a lot of…fun. I have three primary criticisms. 1: There are only a couple of primary strategies. 2: Most of your turns will be uninteresting. First, the strategies in the game seem very limited. The most obvious strategy is to build a robust tableau in order to grab more expensive, point-granting cards for free or nearly for free in the late game, or you can collect gem chips almost exclusively in order to limit the number of available gems for other players, and to purchase point-granting cards before the tableau building people can gain momentum. Obviously you can work in between those two extremes, but those are generally the two routes available to you. I do not find this particularly compelling. But wait! Games do not need to have a robust level of strategic decision making in order to be good. Many excellent games rely on fantastic tactical-level decisions, where you must constantly read the state of the games and your opponents, and react and respond to both in order to gain an upper hand. Unfortunately I do not see a lot of that with Splendor. The best opportunity for this is with the card-reservation mechanism, where you can take a card into your hand in order to block an opponent’s strategy. I admit that I have seen some particularly clever moves using this, but they seem to occur exclusively in the late game, where in a 3 or 4 player game usually all but 2 players are effectively eliminated from contention. The tableau of cards to select from. The cards come from three different decks of ascending costs. Because of this I find 2 players to be the best player count for Splendor. As in nearly all games that have an aspect of denying potential avenues of play, the potency of said denial decreases as you increase the number of players at the table. More precisely, if you have a move which denies your opponent 5 points while gaining you none, this is a net advantage in favor of you of 5 points in a 2 player game. If there is a third player at the table and this denial play does not affect their strategy at all, you have put yourself at a disadvantage relative to them. The denial move might still be the correct play, but it is fundamentally weaker with the 3rd player present. Back to the main point, because there are such large number of cards available (12 in total), and because they cycle quite frequently (every time someone purchases a card it is immediately replaced), denial plays only tend to happen towards the end of the game where a player sacrifices their turn to block the game-winning purchase from the leading player, giving everyone a couple more turns to potentially get lucky and stumble into a high-level card that favors their tableau. This is the main avenue of reactive decision making. I have not found the others available in the game particularly interesting or common. My second primary criticism builds off of the first. Because Splendor does not give a lot of reactive or tactical play, most of your turns are going to be very uninteresting or obvious choices. If you are mostly focusing on tableau building, you will be trying to buy the cheapest cards possible to maximize efficiency. You may skew from that somewhat in order to target a particular noble. If you are aiming towards particular point-scoring cards, you will spend many turns gathering the gems printed on said card in order to purchase it later on. This makes turns extremely short but also rather dull. Once you set your sights on purchasing a particular card or building up a particular tableau you will play through several turns arriving at that goal, and none or few of them will be interesting. My final criticism is that Splendor just doesn’t have very much tension. To illustrate this, let’s compare it to a very similar game: Ticket to Ride. Both games employ an identical mechanism: on your turn you may purchase something from the general pool available to all players, or you may gain resources to fund purchases, but you can’t do both. Inherently this turn structure should create interesting decisions, because if you build up your pool of resources, you run the risk of someone else buying the card or train route that you want. Splendor and Ticket to Ride differ on that mechanism in two very important ways. In Ticket to Ride there is a push your luck element because if you do not want any of the train cards in the display, you may draw blindly from the deck. In Splendor, all of the chips and cards available are face up. In Ticket to Ride everyone’s hands of train cards are hidden, while in Splendor your chips are public knowledge. These two differences make an entire world of difference. Because you never know what routes the other players will be able to build, and which routes they want, that fundamental tension created by the turn structure is amplified in Ticket to Ride. Every time you opt to gather train cards when you could be building a route you are pushing your luck that someone else will not block you. In Splendor you will always know which players are able to purchase the card you are eyeing before your next turn. By having more public information Splendor is less random than Ticket to Ride, but it is also less tense. I think this is a beautiful example of why sometimes taking away randomness can harm a game. I know there are many out there who will disagree with me on this, and I like perfect information games fine, but the fact of the matter is that I simply have more fun playing Ticket to Ride. Long term, because there is very little randomness in Splendor, I can see it becoming an engaging game at high-levels of play, particularly as a 2 player game. I think if a group of people play the game a lot and develop a more acute sense of how to analyze and calculate various strategies and decisions, a lot of the criticisms I have about the game might fade away. I also think that there is potential here for a somewhat interesting metagame to develop among a group of players. The problem is that the game isn’t interesting enough for me to want to get to that level. It looks dull, individual turns are too short and uninteresting, there isn’t enough tension at low or medium level play, and there are better, similar games on the market. I don’t have a bad time playing the game, but it’s not compelling either. The best part of the game are those fantastic poker chips. *The fact that I prefer to use the word tension to describe this instead of softer words like suspense or uncertainty probably says a lot about me as a gamer. I have always felt this is loosely based off Jaipur, he even credits the game designer as they are friends. You sum up a lot of my thoughts! That’s very interesting. Now that I think about it, it does have some similar elements to Jaipur, though I think I like Jaipur a bit better. I never made the connection before. I was thinking about Jaipur whilst reading this, but more on the fact that I was thinking that they probably could have packaged Splendor identically to Jaipur and reduced the box size by about 60%! Conversely I wonder whether, had Jaipur been produced in a box the size of Splendor’s, and it’s trade tokens been the same sort of poker chips… would it have been more (rightly) successful?